Ok, just kidding but that is an actual screenshot from the series, no editing at all XD I suppose the fact that Macross is 25 years old has something to do with the sometimes curious animation quality. So why, you ask, would I be watching such an old series? Well, I’ll admit I’m not a mecha/roboto fan so Macross, Gundam, etc are not my usual choices for anime watching but trying new things is always good, right? Another reason I chose SDF Macross is that I want to watch Macross Frontier and thought getting some knowledge of the previous series would be good, plus it’s gotten good reviews. Well, it’s hard to go back and view a series released so long ago right after watching a modern series in pristine 720p quality but after a few episodes I actually got used to it. Not that the animation quality could ever be called good… Heck, I don’t even think it was good back in the 80’s when it was created but that’s not the point here ^^; The series itself is pretty solid. I was actually a bit surprised that a series so “ancient” could keep me entertained as much as it did. Human existance changes forever when an alien space ship crash lands on earth. Civil wars erupted as a new U.N. was formed to restore the advanced battleship. Ten years later with peace restored, the ship is finally repaired. On the day it is set to launch aliens known as the Zentradi attack from orbit. 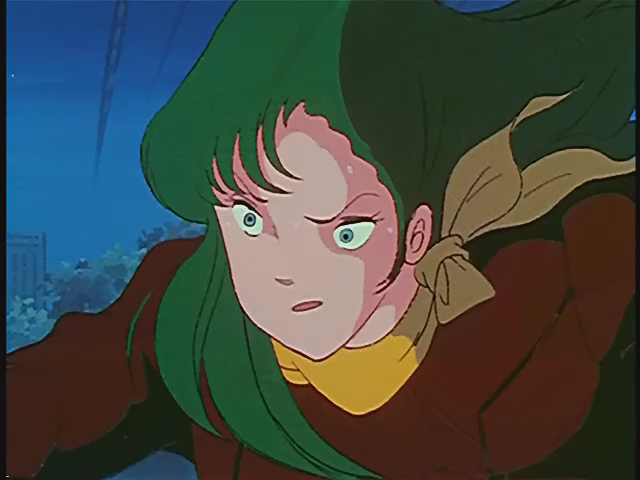 The ship, now named the Macross, automatically responds to the attack by firing its main cannon which destroys several of the enemy battleships. As the assault continues, the Macross is forced to launch and use its folding system to transport out of the area. After folding, the crew finds itself on the far side of the solar system and must find its way back to earth (without folding). From that point, the story centers around the Macross attempting to make its way back to earth all the while evading and defending against Zentradi attacks. There’s a lot of references to the harshness of war and the hardships it brings to people. I won’t give away the details, but the story gradually progresses into a love story as well and actually ends focused on love in place of war. This turns out to be the key to turning the Zentradi war around in sometimes amusing ways. I’ll give you a hint you probably already know even if you’ve not seen the series: songs save the day! Final Verdict: If you feel like some old-school anime with mecha, drama, and romance, this is a good series to check out. Also might help as a lead-in to Macross Frontier.